YOU MUST BE 18 OR OVER TO BUY AND/OR USE ANY CIGELECTRIC PRODUCT. Keep all e-liquid stored in a safe location out of the reach of children and pets with child safety caps securely on. WARNING: This product is not intended for use by persons under legal smoking age, non-smokers, women who are pregnant or breastfeeding, or persons with or at risk of heart disease, high blood pressure, diabetes, or taking medicine for depression or asthma. This product contains nicotine. If you are allergic to nicotine, propylene glycol, or any combination of inhalants, consult your physician before using any CigElectric products. Discontinue use and consult a physician if you experience nicotine misuse symptoms such as nausea, vomiting, dizziness, diarrhoea, weakness and rapid heartbeat. Our products do not treat, diagnose, or cure any disease, physical ailment, or condition. Keep all products out of the reach of children and pets as ingestion of certain pieces can present a choking hazard. Nicotine can be toxic if inhaled or ingested in large doses, and may cause irritation to eyes and skin if exposed. Wash immediately with soap and water upon contact. Nicotine is highly addictive. CigElectric products are not marketed for use as a smoking cessation product. We are not a pharmaceutical company and we do not sell medical products. Electronic Cigarettes are electronic devices, many electronic devices contain a battery which may fail. The result can be potentially harmful, as certain types of batteries may expand or leak. Do not leave batteries charging while unattended or overnight. Only charge your battery with the correct charger purchased from CigElectric. Electronic cigarettes should be treated as any other delicate electronic device to avoid damage to the battery, other components, or harm to yourself. Electronic cigarettes should not be left inside a vehicle unattended or anywhere which may expose the battery to high temperatures. CigElectric does not manufacture any products we sell and therefore may not be held responsible for manufacturing defects, in appropriate usage, modification, or uses other than intended. Every electronic device requires maintenance and care. Failure to properly maintain your electronic cigarette, inappropriate usage, modification or damage caused by abuse or mistreatment of the product will result in invalidating any warranty claims, and constitutes an assumption of liability on the part of the user. 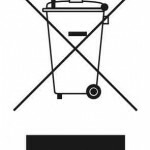 This symbol means that this product and any batteries it contains must not be disposed of with your household waste. Instead, it is your responsibility to hand this over to an applicable collection point for the recycling of batteries and electrical and electronic equipment. This separate collection and recycling will help to conserve natural resources and prevent potential negative consequences for human health and the environment due to the possible presence of hazardous substances in batteries and electrical and electronic equipment, which could be caused by inappropriate disposal. For more information about where to drop off your batteries and electrical and electronic waste, please contact your local council, your household waste disposal service, or the shop where you purchased this product. Contact [email protected] for additional information on WEEE and waste batteries. This product contains a Lithium-ion Battery. You have the right to cancel an order from the moment your order is placed until seven working days after receiving your goods. This includes all products from CigElectric excluding e-liquids if the seal has been broken on the bottle. If you would like to cancel your order please contact us within this period. By using this Site, you signify your acceptance of this policy, our legal disclaimer and terms of service. If you do not agree to this policy, please do not use our site. Your continued use of the site following the posting of changes to this policy will be deemed your acceptance of those changes.